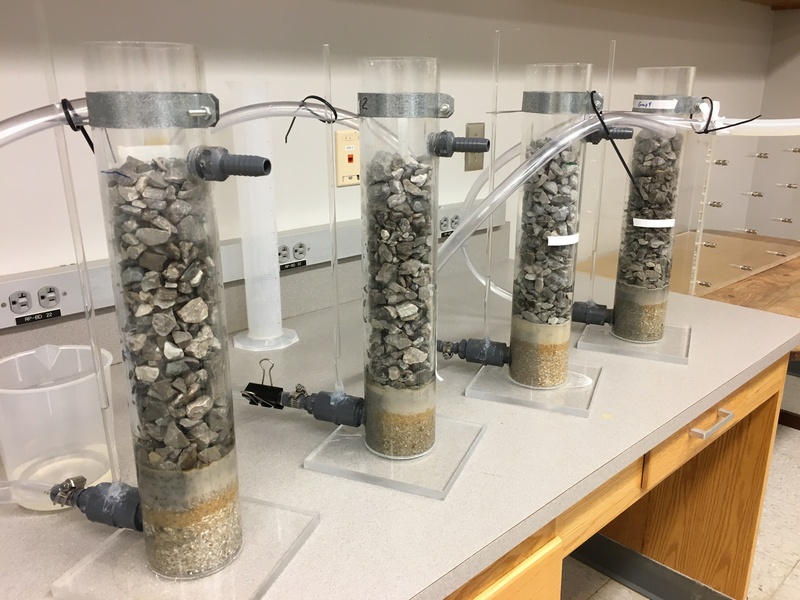 Columns used to simulate infiltration in septic system trenches in Elliott’s lab. TUSCALOOSA, Ala. — Two student-led research teams from The University of Alabama are part of a federal program to develop sustainable technologies to solve current environmental and public health challenges. Teams from 30 colleges and universities received grants to participate in the United States Environmental Protection Agency’s People, Prosperity, and the Planet, or P3, grants program. UA was the only institution with multiple teams selected. Both teams represent UA’s College of Engineering. One designed an innovative septic system while the other created software to help cities find areas to install green infrastructure. Funding for the P3 competition is divided into two phases. Teams selected for Phase I awards receive grants of up to $15,000 to fund the proof of concept for their projects, which are then showcased at the National Sustainable Design Expo. In April, the UA students presented their concepts at the expo held in Washington, D.C. The UA teams will continue to work on their projects while competing for Phase II awards of up to $75,000 to further develop and implement their designs. Elliott advises a team led by Parnab Das, a graduate student studying environmental engineering. This group hopes to modify current septic tank systems to decrease the chance of failure, especially a common failure in the impermeable clay soil in the Black Belt, an economically depressed region in the state. These failures cause a backup either of sewage in plumbing in or near the home and risk sending untreated wastewater into the streams, lakes, rivers and groundwater nearby. A screenshot of the GIS-enabled infrastructure design tool. Among other changes, the team’s design would swap the gravel in the septic trench, where wastewater typically flows downward into the soil, with a plastic media better at filtering the water while also creating a narrower trench to force the water to travel over the filtering media more slowly. There would also be some modifications to the bottom of the trench to slow the clogging process delaying hydraulic and environmental failure. “The idea is to take the trench of a conventional septic system and improve it, without adding much cost to the installation and maintenance of the traditional system,” Elliott said. The second UA team is led by civil engineering graduate student Ashton Greer and is advised by Dr. Andrew J. Graettinger, UA professor of civil, construction and environmental engineering. This team is creating an online software program to help urban planners and civil engineers find areas where green infrastructure are affordable and viable alternatives to traditional concrete infrastructure in storm water management. Green infrastructure uses natural processes such as vegetated swales to handle drainage instead of simply wrangling storm water into concrete drainage systems. Local governments are often not familiar with planning and implementing green infrastructure. Greer and her team are developing a program based off an open-sourced Geographic Information System, or GIS. 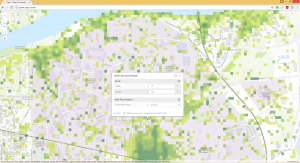 Users of the program select potential locations for an infrastructure project along with design parameters, and the program gives preliminary designs, cost estimates and environmental benefits for green infrastructure options using available GIS information such as elevation, land cover and soil data. 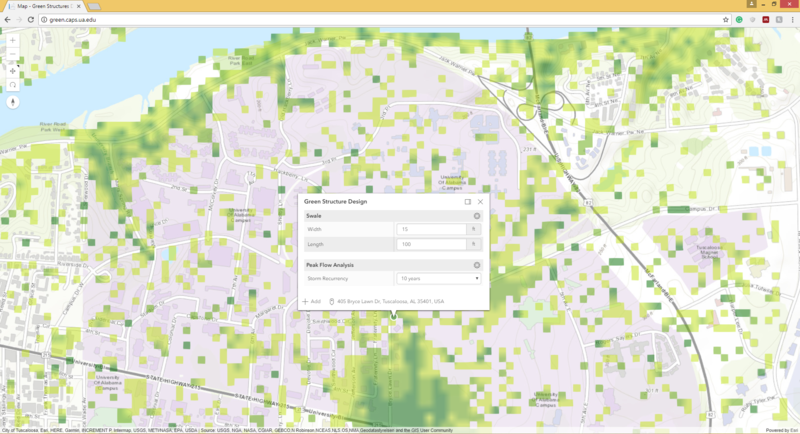 “The output from this on-line, map-based tool is a construction plan sheet that can be used to construct the green infrastructure,” Graettinger said.